The state legislature has been busy the last few weeks as lawmakers settle in for the long legislative session. Obviously, the budget will take center stage throughout the year as many try to grapple with the worst fiscal calamity the state has seen in quite some time. But that hasn’t stopped lawmakers from pressing other issues early in the session, many of which I’ve covered. This post is a quick look at some of the issues I’ve been assigned in the last two weeks. Most items are just making there way to a Senate or House committee, which is only the first step in a very long and sometimes complicated process to become law. Another measure that would push the February primary date back to March also passed the Senate. Google groups. I’ve been invited to two just this week, and they are so simple but effective. Google Buzz. I haven’t really used this capability yet but it seems full of potential. Chat. I have used chat in the past and it’s great. Organization. All e-mails in Gmail and their replies are keep in the same thread, making navigation and organization incredibly easy. MSN stagnation. Hotmail hasn’t changed it’s outlook significantly in 10 years. Think about that for a second. iGoogle. I use Google Maps, Google Reader, Google Docs, Google Calendar and Google News, which all can be conveniently organized using iGoogle. Why not just complete the package? My new account is csessig@gmail.com. As expected, the transition will take a lot of time and probably cause some headaches along the way. But I think the switch will be for the better. For those journalists out there that haven’t yet heard of Publish2, go take a look. It’s basically a social networking web site for journalists (think Delicious), and, more importantly, a great tool to organize all of your newspaper clips from the Internet. It even has a toolbar add-on for Firefox, making it even easier to link pages to your Publish2 web page. One of the most strenuous aspects of job hunting is finding the appropriate clips for the job. Of course, some clips will work better for some positions. Others won’t. This web site makes it incredibly easy to keep track of those clips, allowing journalists to fluidly go through them later. Seriously, go check it out. And that’s it for the housekeeping matters. Useful posts coming soon. Between work, two classes and working out, Monday’s are pretty meh. SPRINGFIELD – A swelling, multibillion dollar deficit has left Illinois months behind in its payments to providers across the state. For instance, the Williamson County Early Childhood Cooperative in Southern Illinois is planning to send layoff notices to its 41 employees in the next few weeks because money from the state has not come through. Director Linda Drust was at the Capitol on Wednesday as part of a rally for an income tax increase. “I’m just being a realist here. In an election year, I don’t see a lot of people voting for this even though they know we need it,” [state Rep. Brandon Phelps, D-Harrisburg] said. The scene at the Capitol on Wednesday was pretty chaotic and made navigation difficult. Fortunately, I was able to get the information for antidotal led well before the speeches started. At 11 a.m. the Capitol was so packed, security had to temporarily close it for an hour. Amendments proposed by state Sens. Kwane Raoul, D-Chicago, Michael Frerichs, D-Gifford, and Ed Maloney, D-Chicago, would implement a progressive tax structure but wouldn’t increase taxes. If one was approved by the General Assembly, it would be on the November ballot for the voters to decide. “Across the country we’ve been hearing words like ‘grim,’ ‘dire,’ ‘guarded,’ and ‘cautious,” said Arturo Perez, a fiscal analyst with the NCSL. So for about three hours on Wednesday, action at the Capitol was non-stop. And it all dealt with one issue: the state’s horrific fiscal climate. Image posted by Flickr user alancleaver_2000. It is used under a Creative Commons license. SPRINGFIELD — Farmers barred from using all-terrain vehicles to access their fields could catch a break under legislation that gained initial support from lawmakers Tuesday. A Senate committee voted 11-0 to approve the measure, which would exempt farmers using ATVs from new regulations governing low-speed, non-highway vehicles. UPDATE (2/16 at 6:30) – A Senate committee unanimously supported a measure that would exempt farmers from the state law. I’ll have a link when it’s posted online. SPRINGFIELD — A new state law that attempted to clear up some of the confusion concerning low-speed, non-highway vehicles has unintentionally barred farmers from using all-terrain vehicles on local roads. Now, the same lawmakers who pushed for the law are working to undo some of it by exempting farmers from its provisions. Starting this year, municipalities were given the power to approve ordinances legalizing ATVs, golf carts and other low-speed vehicles on their roads. Before the law went into effect, many were unsure if they could. The new law, however, trumped a similar measure approved three years ago that gave farmers great leeway when operating ATVs on rural roads to get from field to field. Because ATVs are now included in the same law that governs other low-speed vehicles, the new restrictions apply. Lyle Gallagher, a farmer from Sadorus, has owned an ATV for five years and uses it because normal-sized cars are impractical in the fields. “It’s like my right arm,” he said. This isn’t the first time I’ve covered low-speed vehicles. While at the Journal Gazette Times-Courier, I wrote about a small community in eastern Illinois that decided to pass an ordinance allowing golf carts on their roads. The new law was supposed to clear up some of the confusion concerning low-speed vehicles because not every community was sure if they could pass a similar ordinance. Now they can. But as I noted, ATVs are now inadvertently barred on unmarked highways, which are heavily used by farmers. Be on the look out for this to be corrected this session. I will be covering the new laws as they work their way through the legislative process. On a lighter note, nothing exemplifies the difference between Chicago bureaus and the Downstate bureaus quite like this story. I doubt the city of Chicago cares much about ATVs, golf carts and neighborhood vehicles. Our audience, however, will eat it up. The Southern ran it on the front page, above the fold. Go figure. An Ad. For a Jimmy Buffet concert. Strange. I’m not sure if this was intended but if it was, it was quite ineffective because I had no idea what it was before I opened it in a new tab. My monitor at work obviously couldn’t view the image properly, and I’m sure my computer wasn’t the only one with viewing problems. 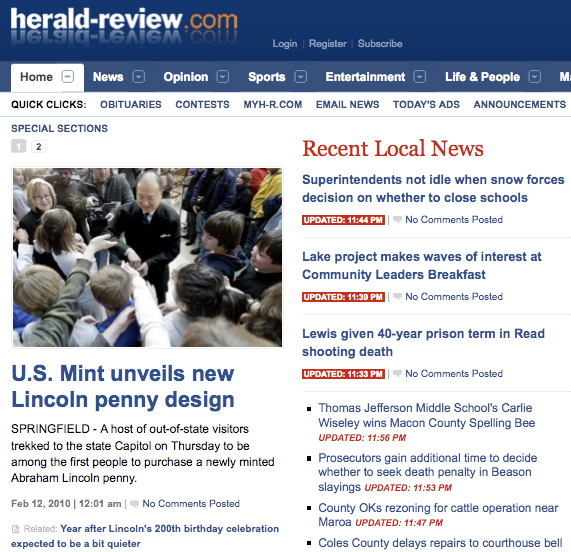 But the larger question is: does this signal a new trend being used by newspaper web sites to display ads? Are more and more newspapers web sites going to willing to change their own background–which naturally becomes a very familiar sight for repeat visitors–to make an extra buck? And if they are willing to do this, where will they stop? This isn’t the first time the Sun-Times has used “innovative” techniques to advertise on their web site. Right now, they have one of those ads that expands the entire length of the web site when you first open the site, forcing the user to close them. I can get over those ads. But they have to draw the line somewhere before their entire web site turns into a mass collage of ads. Have you seen any interesting ads on newspaper web sites? 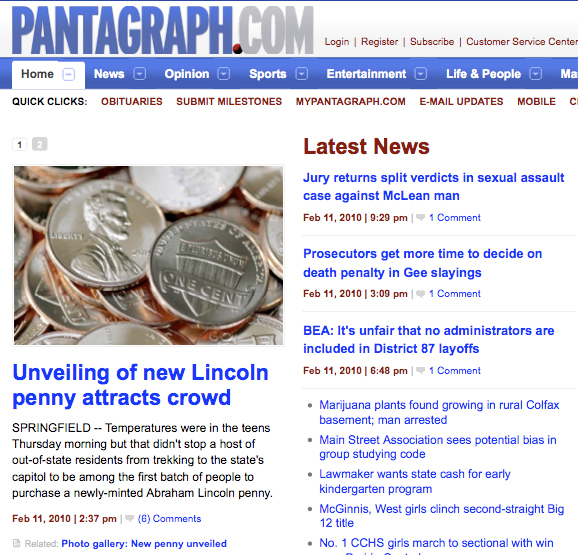 SPRINGFIELD — Temperatures were in the teens Thursday morning but that didn’t stop a host of out-of-state residents from trekking to the state’s capitol to be among the first batch of people to purchase a newly-minted Abraham Lincoln penny. Kentucky, Missouri and Indiana were among the states represented at the unveiling of the new coin, which came on the eve of Lincoln’s 201st birthday. The line to purchase the pennies formed as early as 5 a.m. and wrapped around the Abraham Lincoln Presidential Museum shortly before the ceremony kicked off at 9:30 a.m. There were plenty of angles to take on this story, but I thought it was fascinating how far people were willing to travel to purchase a few rolls of pennies. The new coins will be around for the next 49 years, after all. But coin collectors, like other enthusiasts, are very passionate about their trade and more than willing to go that extra mile (or 200, which every be the case) to support the hobby they love.